Like us, you believe in long-term value over short-term gains. And you're always planning for what's next. At Berkadia, we take care of the details of selling assets, securing the right financing and servicing your loan for its entire lifecycle. This certainty of execution lets you keep your sights right where they need to be: on the horizon. 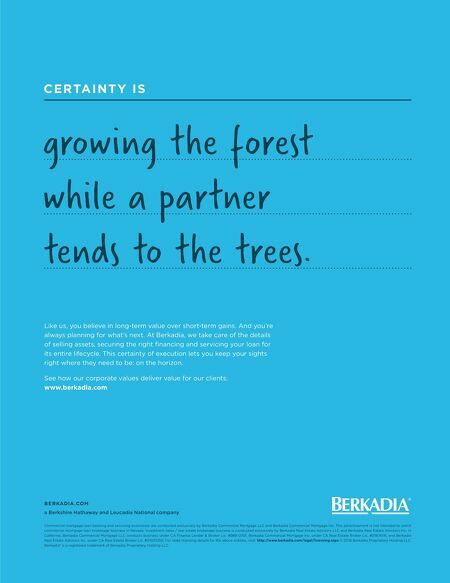 See how our corporate values deliver value for our clients: www.berkadia.com C E R TA I N T Y I S growing the forest while a partner tends to the trees. B E R KADIA .COM a Berkshire Hathaway and Leucadia National company Commercial mortgage loan banking and servicing businesses are conducted exclusively by Berkadia Commercial Mortgage LLC and Berkadia Commercial Mortgage Inc. 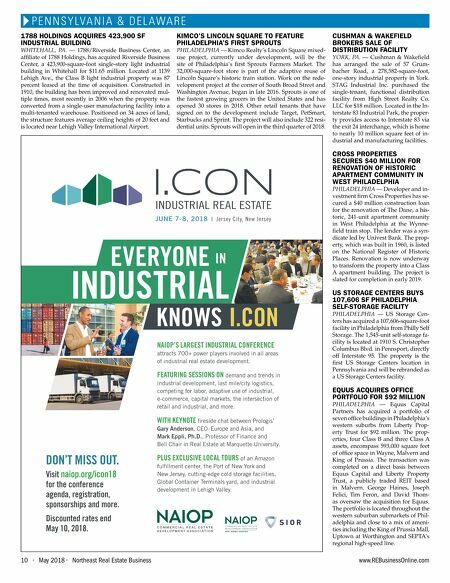 This advertisement is not intended to solicit commercial mortgage loan brokerage business in Nevada. Investment sales / real estate brokerage business is conducted exclusively by Berkadia Real Estate Advisors LLC and Berkadia Real Estate Advisors Inc. In California, Berkadia Commercial Mortgage LLC conducts business under CA Finance Lender & Broker Lic. #988-0701, Berkadia Commercial Mortgage Inc. under CA Real Estate Broker Lic. #01874116, and Berkadia Real Estate Advisors Inc. under CA Real Estate Broker Lic. #01931050. For state licensing details for the above entities, visit: http://www.berkadia.com/legal/licensing.aspx © 2018 Berkadia Proprietary Holding LLC. Berkadia® is a registered trademark of Berkadia Proprietary Holding LLC.